If you are looking for an uncluttered desk space or just want to position your keyboard however you like, a wireless keyboard is the answer to your problem. That being said, there is no denying that it can be difficult to select what wireless peripheral you should actually get. After all, the best wireless keyboard needs to be easy to set up, offer up great connectivity, and have a layout that makes it simple to use. If you’re trying to buy a wireless keyboard that fits into all these criteria, then you have come to the right place. We have included the products that offer all the features mentioned above. Also, to make this review more helpful, we have included a buyer’s guide as well. The first thing that you will notice about this keyboard is the design. It boasts a Constant Curve layout that is largely specific to the Wave design. Now, although it may seem like it, this isn’t for aesthetic purposes. The keyboard has been built this way so that it is more ergonomic and thus easier on your hands and wrists. To add to this, there is also a cushioned palm rest that makes the keyboard even more comfortable to use. The keyboard has an adjustable height so you can select which position is most comfortable for you. At the same time, the design of this keyboard is a bit of a setback. Since it is so unusual, it does take some time to get used to working with. The other advantage with this keyboard is that it boasts up to 3 years of battery life. As such, there’s no need to worry about swapping out the batteries every so often. Then, there is the fact that this keyboard provides you with top-notch connectivity. This is all thanks to the 2.4 GHz wireless connection which allows you to keep the keyboard further away from the laptop. It is also a secure connection with the 128-bit AES encryption. Finally, this wireless keyboard has lots of additional features like media-specific buttons and programmable keys to make this a more customized experience for you. What stands out with this wireless keyboard is just how compatible it is with a number of different devices. 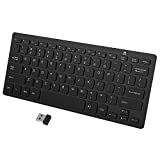 As long as your device has Bluetooth, this wireless keyboard will work with the four major operating systems – Windows, iOS, Android, and Mac OS. So, it actually works well with various computers and tablets, making it quite versatile. You will find it incredibly easy to take this keyboard with you wherever you go. Not only is it ultra-compact, but it also weighs just 0.37lbs, making it super lightweight. The battery on this wireless keyboard is pretty impressive as well. It is rechargeable and with an average amount of use, it can actually last up to 6 months at a time. The minor downside is that the battery indicator on the keyboard isn’t very good, giving you only a short time to charge the keyboard. Now, due to the design of the keyboard, you will find that it is actually easy to type whatever you need. There is no learning curve involved at all. You will also notice that the keyboard is very quiet so you won’t make any noise while you type. Perhaps what makes this keyboard really stand out is the seven LED backlights that you can select from. This makes the keyboard more eye-catching and also helps while typing in the dark. One of the features you are sure to love with this wireless keyboard is just how easy it is to set up. It relies on a plug-and-play feature that allows you to use this keyboard within moments. Best of all, once the receiver has been set up, you get to enjoy a connection for up to 33 feet. Therefore, you can place the keyboard anywhere you like and be certain that your connection will not be lost. The design of the keyboard is also pretty great. The keys are low-profile and boast an advanced scissor switch mechanism which ensures smooth and easy keystrokes as you type. It should be noted, however, that some of the keys are missing. Specifically, some of the F function buttons are not present and this may be a problem for some. For the most part, this keyboard has a pretty decent battery life. You can use it for around 3 months at a time, without needing to recharge it. There is also a power saving mode which can help you extend the battery life as well. This is a wireless keyboard that is just made for travel. The slim profile combined with its incredibly low weight allows you to take it wherever you want. The one thing that really stands out about this wireless keyboard is the design. It is streamlined and sleek and is a great addition to any desk. To add to this, the adjustable height means that you can raise or lower the keyboard according to what you find most comfortable. Furthermore, it is very lightweight, making it a great travel accessory for your laptop or similar device. 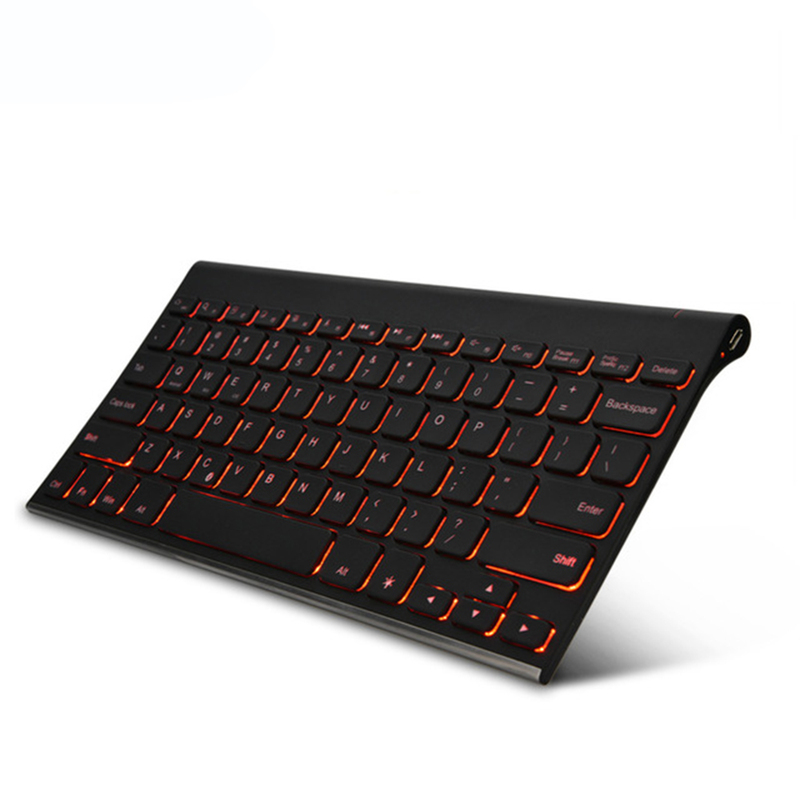 Speaking of connectivity, this is a keyboard you can connect to virtually any device thanks to the 2.4 GHz wireless connection. You can move up to 30 feet away and still have the keyboard connected to your digital device. The keys are also low-profile and most people will find this keyboard quite comfortable to type on. At the same time, this may not be the best keyboard for really fast typists. The feedback from the keys can be a bit slow which, in turn, can make you type slower as well. Now, this keyboard relies on AAA batteries to power it so it can’t be recharged. However, this does mean that you will never have to wait for the keyboard to charge. You can simply slip in fresh batteries and start using it again. Since this is an Apple wireless keyboard, you can only expect it to work with Apple products. Still, it provides great compatibility within the brand. The keyboard is compatible with Bluetooth-enable Mac laptops, computers, iPads, iPhones, Apple TV, and even iPods. Since the keyboard relies on Bluetooth, you can expect the connectivity to be smooth and perfect. What’s more, it works from further away as well. Once the devices have been synchronized, you will be able to use the keyboard from up to 33 feet away. Therefore, you can position yourself in a way that is most comfortable for you. As for the design, the keyboard is raised in a certain way so that it is easier for you to use, ensuring optimal typing efficiency. Now, this wireless keyboard is quite small. In fact, it is up to 24 percent smaller than many other models on the market. On the one hand, this makes it more compact and easier to carry around. At the same time, it also means that you will need time to get used to typing on a smaller surface area. Last but not least, the keyboard relies on AA batteries. As a result, there is no need to wait for it to charge back up, swapping out the batteries allows you to use the keyboard immediately. Now that you are aware of what the best wireless keyboards are for you, let’s move onto how you can go about choosing one for yourself. Bluetooth Keyboards: this technology is becoming more widespread among all tech devices and therefore, tends to be the favorite. There are quite a few advantages with this option, especially as it is quite easy to sync up the keyboard to your other device. Apart from this, though, you will also find that you don’t need a direct line of sight in order for the keyboard to function properly. Also, the data transfer speeds are quite high, allowing you type more quickly and smoothly. However, compared to some of the other wireless keyboard technology, these keyboards may not have as long a range. Radio-Frequency (RF) Keyboards: RF wireless keyboards rely on a method of transmission that is similar to Wi-Fi. As such, they are better equipped for long-distance transmissions which means that you can essentially be as far away from as your screen as you want to. This benefit does come at a cost, though, and most RF keyboards are often more expensive than the Bluetooth models on the market. Infrared (IR) Keyboards: this technology has been around for a while and essentially consists of infrared light with a very long wavelength. Now, the data transmission rate on these keyboards is good so you can expect a fast, smooth typing experience. Nonetheless, the keyboard has to always be in the line of sight and there can’t be any other physical object interrupting the connection. The first thing you will need to check with any wireless keyboard is whether or not it is compatible with the device you want to use it with. First, inspect whether the keyboard can work with the brand of the device. Then, it is a matter of checking whether the keyboard is compatible with the operating system installed on your computer, tablet, or smartphone. Keep in mind, some wireless keyboards have limits when it comes to working with some versions of operating systems. If you are someone who tends to be at their keyboard all day, then you need one that is ergonomic. In short, you require a keyboard that isn’t just comfortable, but also keeps your wrists and hands well- protected. So, what should you search for in an ergonomic, wireless keyboard? To start with, look at the design. How does it support your wrists and palms when you place your hands on the keyboard? You should opt for the design that allows your hands to rest in the most natural position possible. On top of this, analyze the size of the keys, as well as how they are spaced. You will also need to check whether there are rests for your palms and wrists too. As you can imagine, one of the downsides of a wireless keyboard is that it isn’t connected to a power source. Thus, battery life can become a concern for you. When selecting wireless keyboards there are often two battery options to select from – built-in batteries vs. external batteries. Built-in batteries are rechargeable ones that come with the keyboard. These can last anywhere from three months to a few years, depending on how often you use them. The perk with these batteries is that there is no additional cost involved, but you do have to wait for the keyboard to be charged before using it again. With keyboards that rely on external batteries, there is absolutely no downtime, even though there is extra cost included. All you need to do is to replace old batteries with fresh ones and begin using your keyboard once more. Then, there is the size of the keyboard to consider. When determining which size is right for you, take your requirements into consideration. For instance, if you want a keyboard that can travel with you or takes up the minimum amount of space on your desk, then a smaller model is a clear choice. However, this also means there is less surface area for you to type on. If you are more focused on a great writing surface, then a bigger keyboard may be a more suitable option. Adjustability: if you want to make your typing experience more comfortable, get a wireless keyboard with adjustable height. This way, you can change the height of the keyboard according to your sitting position. Aesthetic Appeal: while the appearance of your keyboard certainly isn’t the most important thing, it makes sense to have a well-designed product. Fortunately, wireless keyboards come in all colors and some even have different colored backlights. Additional features: if you are more tech-savvy, opt for keyboards with hotkeys, easy access keys, and other keys that can be programmed. This way, you will be able to sufficiently customize the keyboard to suit your needs. To wrap things up, when searching for the best wireless keyboard, you will need one with great connectivity and compatibility, good design, and is simple to use. If you want more affordable options, the JETech and Arteck wireless keyboards will fall into most people’s minimum price range. In case you prefer a more ergonomic design, the Logitech wireless keyboard is sure to meet your requirements. For those looking for keyboards that don’t need to be recharged, you will find that the Apple and HP wireless keyboards are most suitable. If you follow the tips mentioned above, you will be able to select a wireless keyboard that is just right for you. Good luck with your shopping!